Unicorns Of Love – ESBD – eSport-Bund Deutschland e.V. 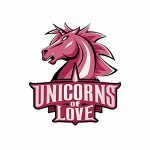 Unicorns of Love won several Go4LoL tournaments in early 2014 on the EU West server. As the year progressed, they started to play in more prominent challenger events and do well, taking third place in the Summer Black Monster Cup. They participated in the first Spring Series #1 play-in but were eliminated by EYES ON U in the second round. On May 15th, PowerOfEvil joined the team as the new midlaner, replacing Xodiaz, and the team qualified for the Summer Series #1 of the EUCS, though they lost to Ninjas in Pyjamas 2-0 in the quarterfinals. After another quarterfinal finish in Summer Series #2, UoL placed 6th in the Points ranking shared with Playing Ducks. However, because only either of them could advance to the Summer Playoffs, the teams had to play a tiebreaker match, which UoL won 2-0 to eventually take the last spot.